The king is the most important piece on the board. 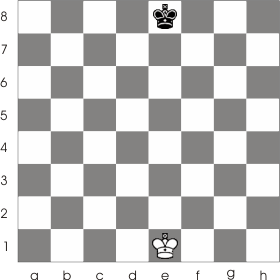 The entire game revolves around the king; more exactly, the purpose of the game is to checkmate the opponent's king. The kings initial positions are as in the following picture. The king can move one square, in any direction, as long as that square is not occupied by one of its own pieces or it's not in the range of action of an enemy piece. The king can capture a piece that is on a square that it can move on. Because the way the king moves - one square in any direction, the two kings must always be separated by a square - so they don't enter one in each others range of action. 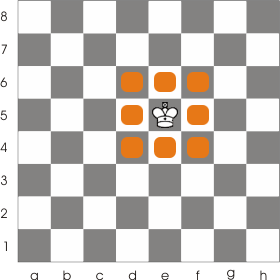 You can see how the king can move in the picture below (the orange squares). The position in the following image is illegal. The two kings must be separated by at least one square. 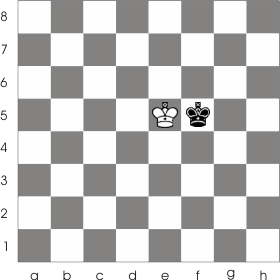 In the following example the white king can only move on certain squares. 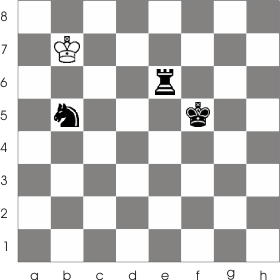 It is unable to move anywhere on the 6th rank because that rank is under the control of the black rook from e6. It can't move on the a7 and c7 either, because of the black knight at b5. So, the only squares on which it can move are a8, b8 and c8. Watch the following example to see how the king can capture an enemy piece. 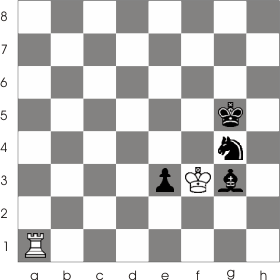 The white king is unable to capture the black knight at g4 because that square is under the control of the black king. It can't capture the black pawn at e3 either, because the e3 square is under the control of the black knight. It can, however, capture the bishop at g3 by taking its place. There is also a special move the king can do only one time in a game in relation with the rook and in certain conditions : castling. But I'll talk about that in one of the following tutorials. For now let's take a closer look at how the games are recorded.